The genetics of dauer arrest were first revealed with the identification of daf mutants in which dauer formation is misregulated (Riddle et al., 1981). Some daf mutants display the dauer-constitutive (Daf-c) phenotype, forming dauers inappropriately regardless of environmental conditions (Riddle et al., 1981). These animals carry mutations either in the daf-2/insulin-like pathway or the daf-7/TGF-ß pathway regulating dauer arrest (Thomas et al., 1993; Gottleib and Ruvkun, 1994; Hu, 2007). 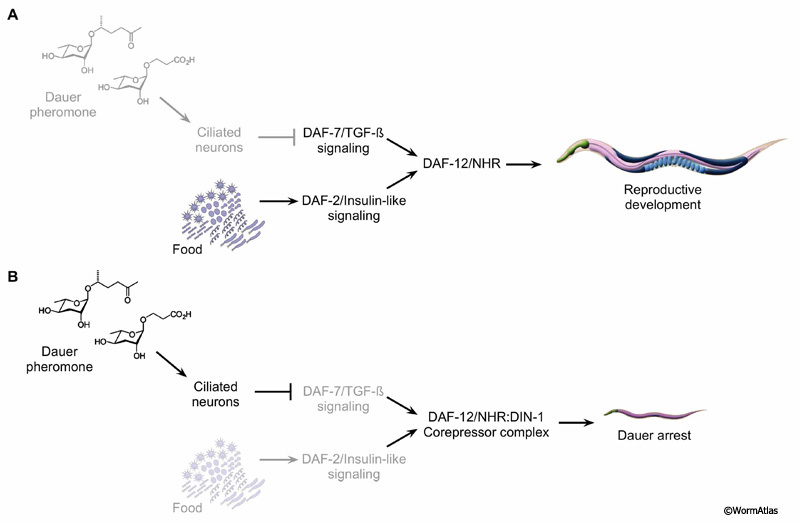 The daf-2 and daf-7 pathways regulate parallel, and independent, inputs into the dauer decision (DGenFIG 1). Mutations inactivating the ligands, receptors or downstream signals for these pathways cause dauer arrest, even in favorable environments. A second group of mutants was also identified that fail to form dauers when combined with specific Daf-c mutants. These dauer-defective (Daf-d) mutants carry mutations in genes that function to antagonize signaling by the daf-2/insulin-like or daf-7/TGF-ß pathways. This research revealed that insulin-like and TGF-ß signaling pathways can function to link environmental conditions to developmental events. Both the daf-2/insulin-like and daf-7/TGF-ß pathways converge to regulate the activity of a nuclear hormone receptor (NHR) encoded by the daf-12 gene (Antebi et al., 2000). Defects in daf-12 activity disrupt the timing of developmental events that occur in the third larval stage, such as gonad leader cell migration and L3 seam cell divisions (Antebi et al., 1998). The daf-12 gene also has complex effects on dauer arrest, as certain daf-12 mutations cause constitutive dauer arrest while others prevent dauer formation. Edited for the web by Laura A. Herndon. Last revision: March 12, 2015.